Here are some examples of division word problems that can be solved in one step. We will illustrate how block diagrams or tape diagrams can be used to help you to visualize the division word problems in terms of the information given and the data that needs to be found. 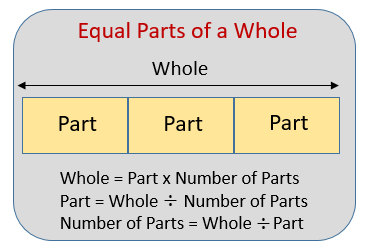 We use division or multiplication when the problem involves equal parts of a whole. The following diagram shows how to use division to find unknown size of parts or groups or to find unknown number of parts or groups. Scroll down the page for examples and solutions. There are 160 grade 3 students in a school. The students are to be equally divided into 5 classes. How many students do we have in each class? We have 32 students in each class. Melissa made 326 cupcakes. She packed 4 cupcakes into each box. How many boxes of cupcakes did she pack? How many cupcakes were left unpacked? She packed 81 boxes of cupcakes. 2 cupcakes were left unpacked. How to solve multiplication and division problems by drawing a diagram? Victor opened a bag of pretzels and counted 56. He gave each of 7 friends an equal number of pretzels. How many pretzels did each friend receive? After playing Belmont, the 24 Islander players traveled to South Boston. This time they went by car and 3 players rode in each care. How many cars did they need? A vet gives the dogs in her office 4 bones each. She used 24 bones. How many dogs got bones? How to make a tape diagram to solve a word problem with an unknown size of groups? Mrs. Silverglat has 21 pretzels. She gives seven students am equal amount of pretzels. How many pretzels does each student get? Practice solving the following multiplication and division word problems. 1. Dan went to the market on Friday. He bought two tomatoes. On Sunday, he bought six times as many. How many tomatoes did he buy on Sunday? 2. In July, a construction company built 360 miles of road. In February, the company laid down 60 miles of road. How many times more road did the company complete in July? 3. Linh ran 21 miles. Linh ran three times as far as Sophie. How far did Sophie run? 4. Molly's bedroom is 220 square feet. Molly's dining room is five times the size of her bedroom. How large is her dining room?